Adalah calls on Israeli attorney general, Israel Land Authority to postpone eviction of Bedouin Arab residents and demolition of their homes. Israeli authorities announced this week that they would demolish the entire Bedouin village of Umm al-Hiran in April. In response, Adalah – The Legal Center for Arab Minority Rights in Israel sent an urgent letter yesterday, 21 March 2018, to Israeli Attorney General Avichai Mandelblit and the Israel Land Authority demanding that they postpone the eviction of residents and demolition of their homes. Israeli police forces entered Umm al-Hiran yesterday in preparation for the April demolitions, posting eviction notices on homes and the village's mosque. 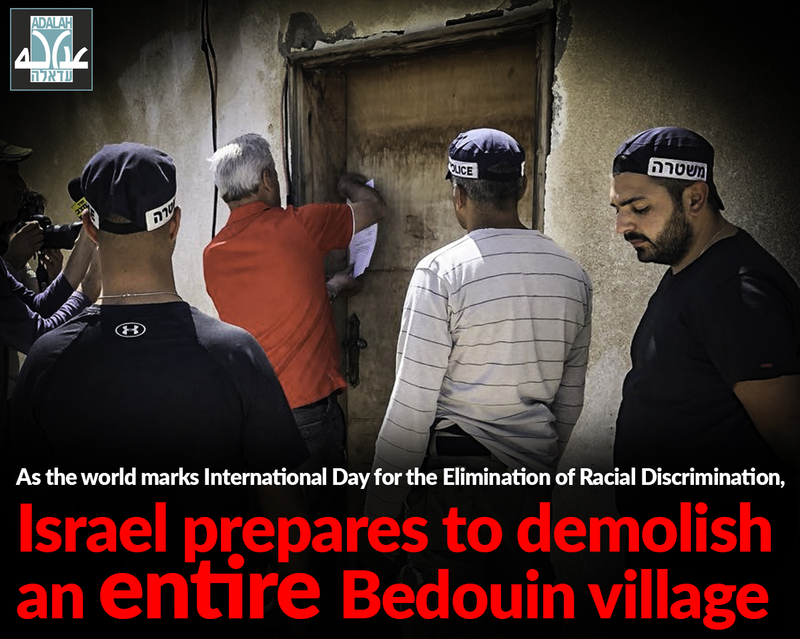 The notices specified that Israeli authorities will carry out demolitions at some point between 15 April and 29 April. Adalah attorneys Suhad Bishara and Myssana Morany wrote in the urgent letter that the demolition of Umm al-Hiran will leave its 350 residents – including many women and children – homeless. "Despite the state's obligations and promises to the Supreme Court, these [eviction] notices have been delivered before a just arrangement has been reached with residents and before they have been ensured an adequate and available housing solution. All of this is taking place in the shadow of the racist and discriminatory aims of the Hiran settlement association which will, apparently, be involved in allocating land plots in [the new town of] Hiran," set to be built on the ruins of Umm al-Hiran. The Supreme Court ruled in 2015 that "the planned town will not prevent [those from Bedouin villages] from living there and anyone who wishes to live in Hiran is entitled to do so." But despite the state's repeated promises to the court that Hiran would accept all new residents – regardless of religion or ethnic background – this is not the case and Hiran is, in fact, closed to non-Jewish residents. 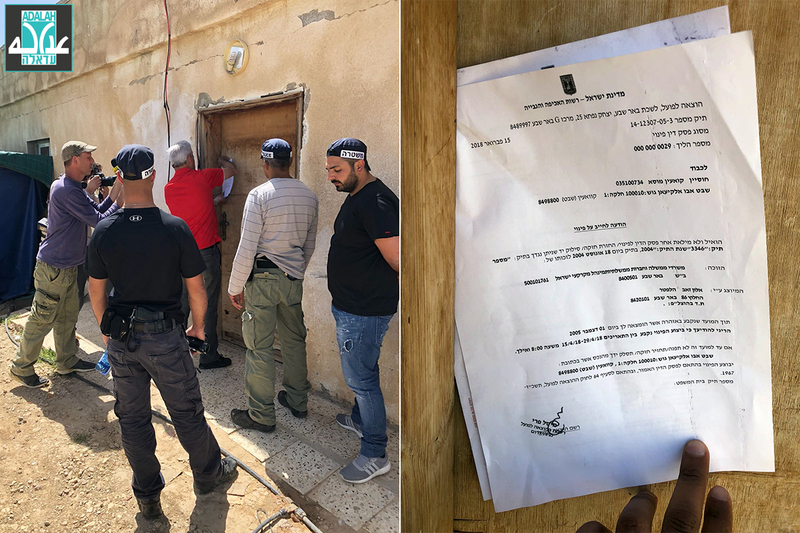 According to a document uncovered by Adalah in August 2017, Hiran's cooperative association bylaws specify that only Orthodox Jews will be permitted to live in the new town. The bylaws read: "an individual may be approved by the admissions committee and become a member of the Hiran cooperative association if they meet the following qualifications: a Jewish Israeli citizen or permanent resident of Israel who observes the Torah and commandments according to Orthodox Jewish values…"
Section of the Hiran cooperative association bylaws indicating resident candidates must be Israeli Orthodox Jews. Attorneys Bishara and Morany emphasized that Bedouin families who have already been uprooted from Umm al-Hiran and transferred to other locations are now living in inhumane conditions, despite the promises of Israeli authorities. Umm al-Hiran families forced by Israeli authorities to sign transfer agreements and to leave their village "live today in dangerous temporary structures without even the most minimal living conditions, and without any hookups to basic infrastructure such as water, electricity, or sewage," attorneys Bishara and Morany wrote. Adalah's letter to the attorney general includes photographs documenting these harsh living conditions.